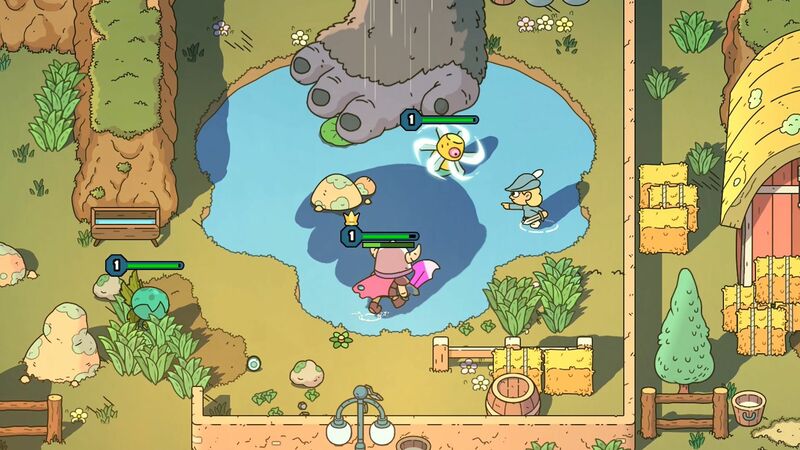 The Swords of Ditto is a roguelike action RPG, that creates a unique adventure for each brave hero that ventures through it’s dungeons and caverns. 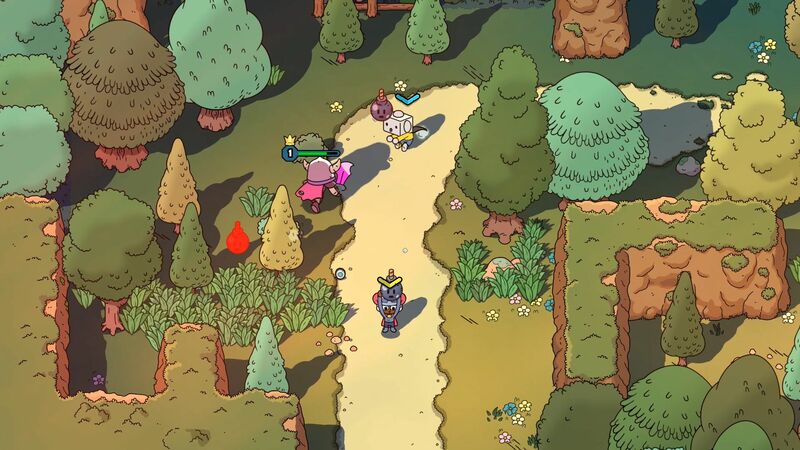 Developed by onebitbeyond and published by Devolver Digital, The Swords of Ditto is a refreshing take on the roguelite action RPG genres. Blending bits of all three to create a unique experience for each player. 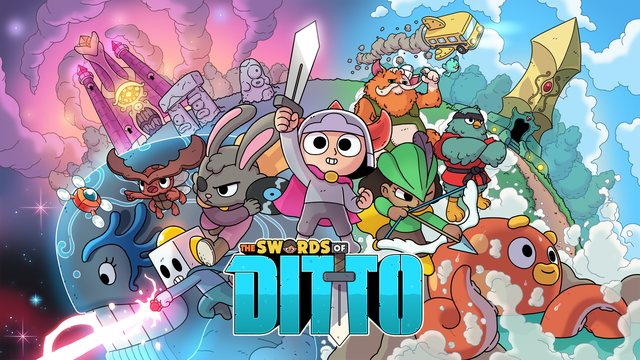 In The Swords of Ditto you play as a Sword of Ditto. A fabled hero who can wield the power of The Sword. They are chosen every one hundred years to defeat the evil sorceress Mormo, and save the realm from her evil influence. It’s your pretty standard dungeon crawler story really. Big bad wants to take over, a fabled hero rises from nowhere and defeats the baddy and the world is saved. Except, it’s not that simple here. When you start a new game you are rushed straight to Mormo. The hero subsequently is killed since they are just some kid this dung beetle started talking to. After that the world is plunged into chaos and 100 years later, a new hero is chosen. This time you aren’t sent straight to a crystal filled death, but to an old turtle. He explains that the sword chooses it’s wielder every 100 years when Mormo rises again, and that you have 4 days to train before Mormo comes to fight you for her right to rule over the land. 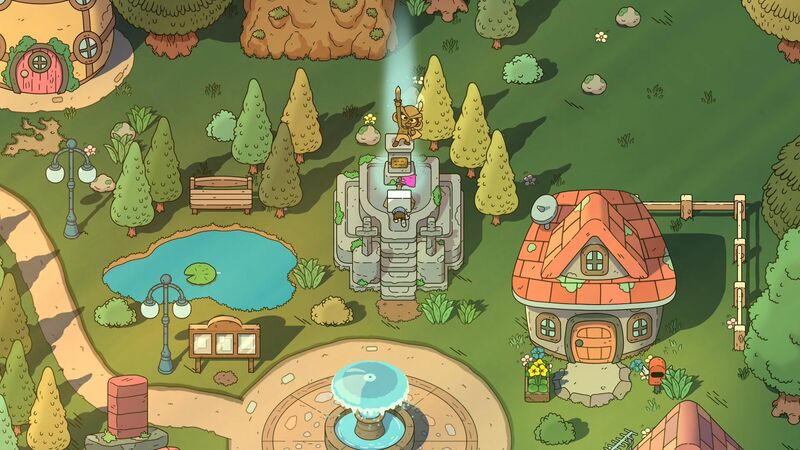 You head through dungeons, pick up gadgets, or in the Ditto-verse “toys”, and level up. All the while you can see how long until Mormo is at full power. You have the option, right at the start, to skip straight to the battle with Mormo if you wish. Each enemy you kill drops various items. 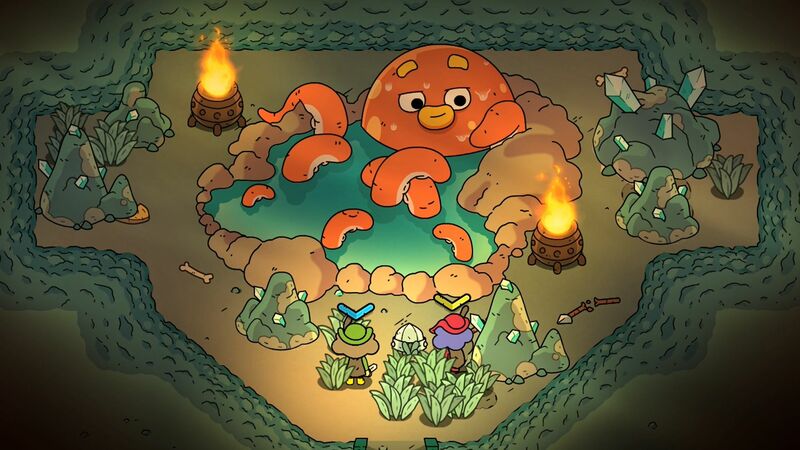 Healing, money and gems, and sometimes, poisonous goo. So be careful with charging head on and not trying to avoid attacks because you will die. Death in this game is quite unique in that you weren’t just making yourself more powerful, but also your fellow heroes who must take up the mantle. When you die, you lose money and items, but not experience as the sword stays levelled up for the next hero to take. If you do die, Mormo reigns for 100 years and the lands become more overrun with monsters, buildings become more destroyed, and people are either not happy or not there anymore. If you survive your battle, you still lose all the items, but the land becomes happier. There’s more people, more wild life, slightly less monsters, and the buildings are in good shape. With both of these outcomes the land changes. Every time you start a new hero, a new world is randomly generated for you. There’s always the same major places in it, but they are remixed to give a nice, fresh feeling each time. As you play you discover logs about mysterious experiments on something called “ether”, you find and talk to Serendipity, one of the major gods of the realm, who can, if you bring her enough of these celestial tokens, can pause or rewind time for you. You get the feeling from reading the logs and talking to her, that something is not right. There’s a deeper mystery as to why The Sword and Mormo fight every 100 years. I’m not going to spoil it here. If you’re already interested head out and grab this game, it’s worth it. Gameplay wise, there’s quite a bit so I will skim over it mostly because some of these mechanics gain a lot more depth the more you begin to understand them through playing. The sword, as I said before, always keeps its level. You can also get small boosts in the form of Stickers. You equip them to your character to give nice little abilities, like being immune to arrows, or causing poison to appear each time you dodge roll. There’s a whole tonne to find, collect, and mash together to make more powerful versions. There’s also the “toys”, this games version of the Zelda dungeon items. However, when you do a toy dungeon to get an item, that item is randomised. So one dungeon you may get a record disc frisbee, the next a drone, and also a watch that lets you fast forward time. There are so many nooks and crannies to explore, people to talk to, and items to collect. You can also play the entire game co-op. I didn’t get the chance to play more than a few minutes of co-op, but it’s very fun. It’s a couch co-op game. You and a friend each grab a controller, or a keyboard, and go for it. Be careful, you CAN affect each other with your abilities. The controls are very tight and responsive, and being able to play either keyboard or controller is a nice touch. I played with both and I definitely recommend playing with a controller, it’s definitely more suited for the fine swings you need to perform. The visuals in this game are stunning. Even with random generation, I never got tired of seeing the same things as they are always remixed in different ways. It’s also very easy to distinguish friend or foe, since enemies have health bars above them. It also shows what level they are, which is very handy for getting some good XP early. Every sticker and toy has a unique look to it, so it’s easy to tell with a quick glance, what’s in your inventory. The sword bearers have a unique look to them. At one point I ended up playing as a rabbit person, which was a surprise. I didn’t even know that could happen. The music is stunning. I had to stop myself from just leaving the game open to listen to the tunes of each area. It gets you into the adventuring spirit without wearing you out. A mixture of serious, fast-paced battle music intertwined with some soft, background pieces in the town’s create a game that never lets you get too frustrated. Who can be annoyed when listening to something like this. The sound effects are pretty good. Each enemy having a different noise they produce for being hit, seeing the player, and being slain by the player. The sword has a satisfying whoosh, and a very satisfying thud when fighting. 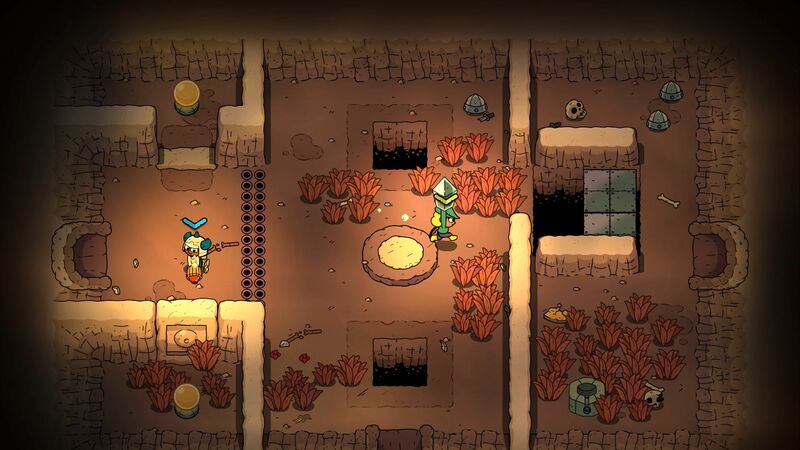 All in all, if you enjoy roguelikes or Zelda, this is definitely something to try out. You can grab it on Steam and the Playstation store for $20. You’ll be getting your moneys worth for sure. The replayability, and also trying to uncover the true secret of Ditto and Mormo, is something that needs to be tried out if you have even the slightest interest in this game.